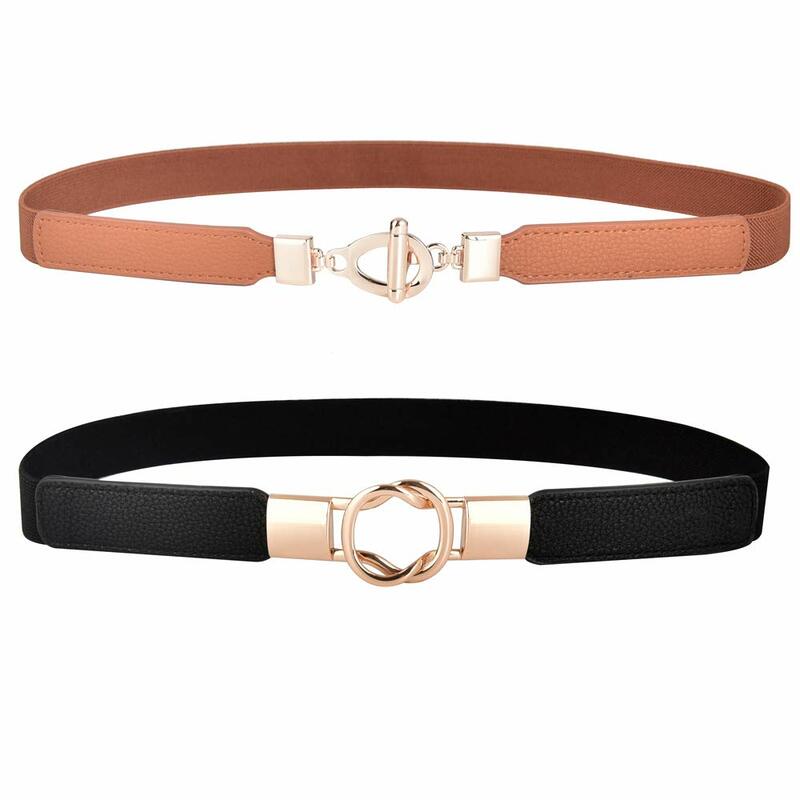 – One purchase for 2 styles skinny women thin elastic belt. Various design gives you different matchtes. Adorable, fashionable and comfortable belt for your outfit.High Stretchy, Skinny ladies belt. 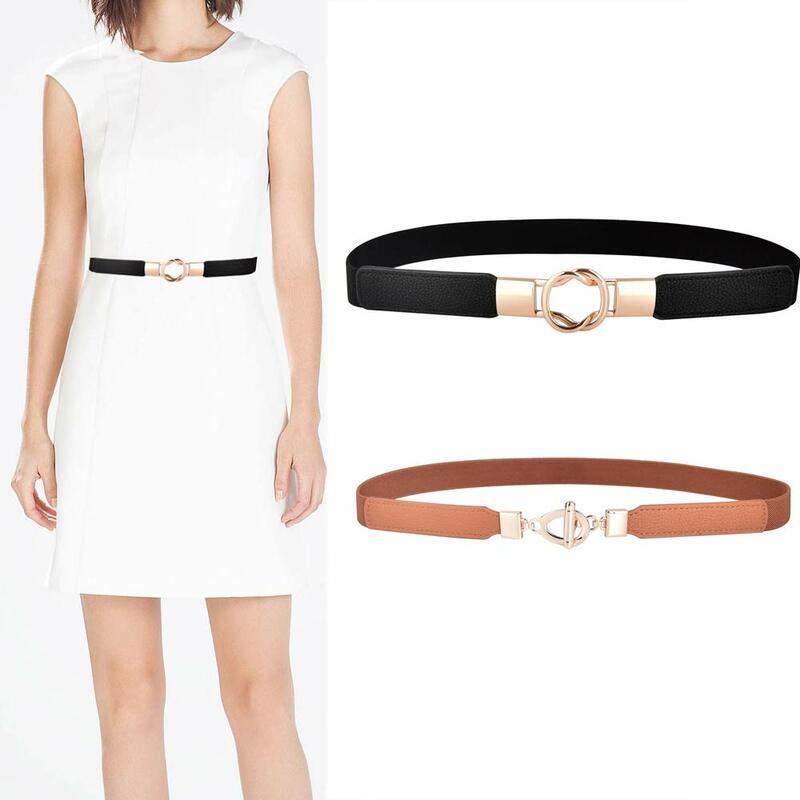 Material- PU leather and elastic band,Alloy buckle.High quality elastic waistband fabric,more comfortable to wear,more flexible on size.great buckle,making a great accent to your dress. Size info- Elastic belt -Small;64CM(25inch) perfect for waist 26-30inch,Medium:72CM(28inch) perfect for waist 31-36inch.And the width of the elastic belt is 0.8inch-1inch(2cm -2.5cm). –Top quality elastic waistband fabric belt, more comfortable to wear, more flexible on size. Great belt for dresses and outfits for any occassions. 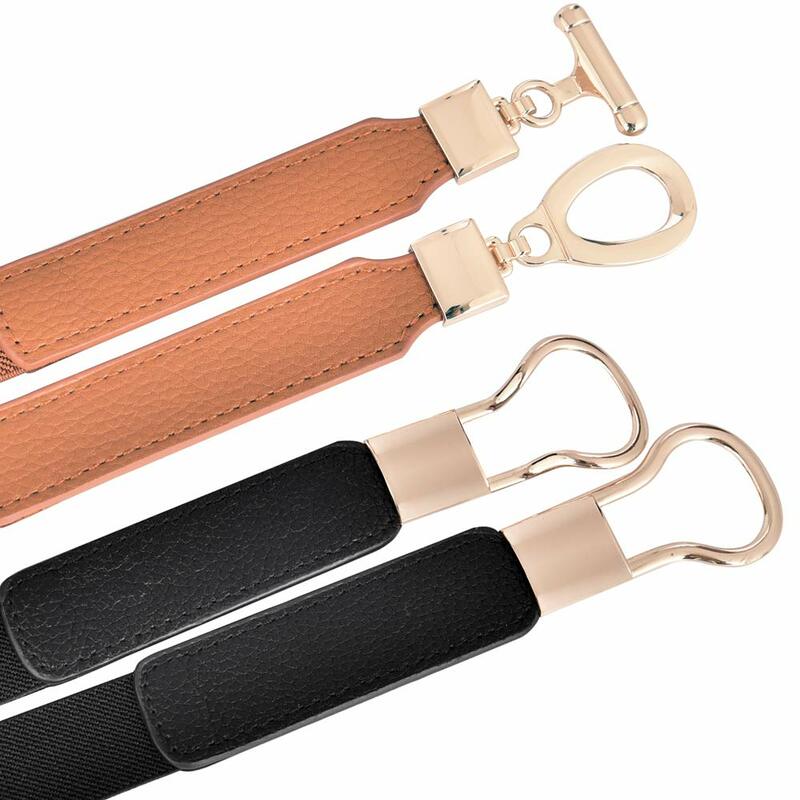 –Good quality metal solid buckle, more convenient to wear or take off. Classic design makes a great accent to your dress. –A should-have cute belt for your wardrobe. Good match for blouse, dress, skirt, coat or sweater, (NOT FOR holding up jeans and pants). Make your outfit look unique and classy. –Our mission is so that you can be fully satisfied with our women belt. Due to this fact, we offer 45 days for free exchange and returns. Also, all our items have 180 days warranty. –As a result of light and computer monitors, the color may vary quite. –Please allow 1-2cm measurement difference As a result of manual measurement. –Please Measure Your Waistline (include the clothes you need to match) to Make Sure the Item Fit you before Ordering. 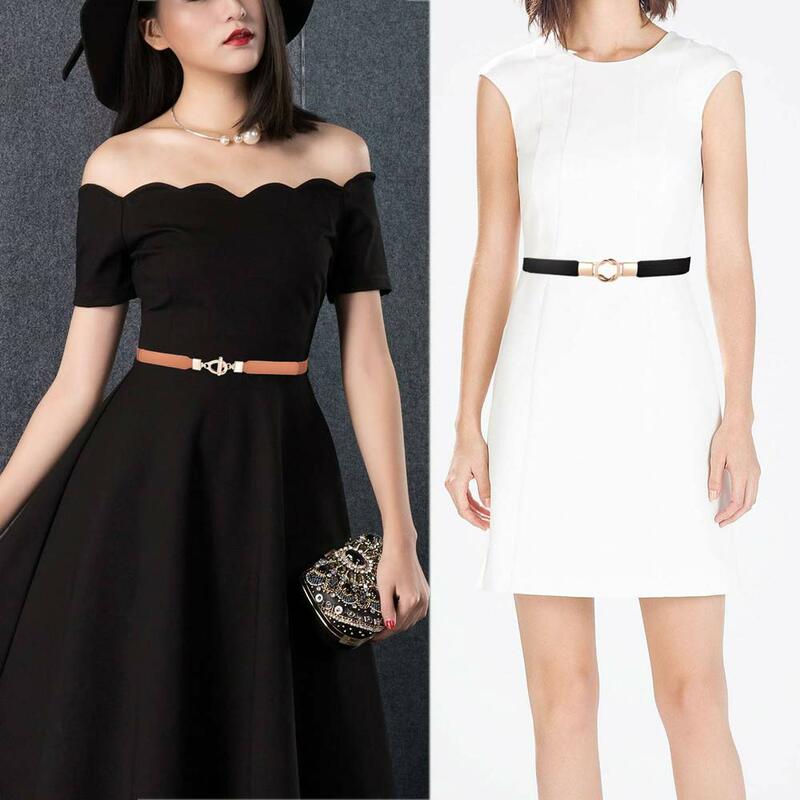 – One purchase for 2 styles skinny women thin elastic belt. More than a few design will give you different matchtes. Adorable, fashionable and comfortable belt for your outfit.High Stretchy, Skinny ladies belt. Material- PU leather and elastic band,Alloy buckle.Top quality elastic waistband fabric,more comfortable to wear,more flexible on size.great buckle,making a great accent to your dress. Super Comfortable- Elastic band is well elastic for a comfortable and perfect fit,This skinny stretch belts Shape your waist,suitable for your any daily look in any seasons,A good match for blouse,dress,skirt,jeans or sweater.Make your outfit look unique and classy. warranty- Our mission is so that you can be fully satisfied with your women belt,Due to this fact,we offer 45 days for free exchange and returns.Also,all our items have 180 days warranty.